"This wonderful multidisciplinary book app challenges children by combining festive fun with problem solving, while teaching the true meaning of Christmas." 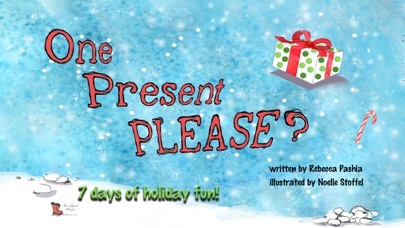 Help Jake open early Christmas presents in this original, Interactive Storybook! You will have to find hidden objects throughout Jake’s house, and beat the tricky, wrapping paper games to earn each gift. After 7 days of presents, Jake learns that giving is even more fun than receiving. Don’t miss the bonus app at the end that allows kids to create and give presents! Let us entertain your kids while you prepare for the holidays. More great book apps are on the way! www.rainbootmedia.com. Removed the promo code at the end. AppSolom is a free and alternative App Store experience. Find app sales and price drops from the iTunes app store.